RJC Yacht Sales pleased to announce Sale of the 156' 1999 Trinity, THEMIS! 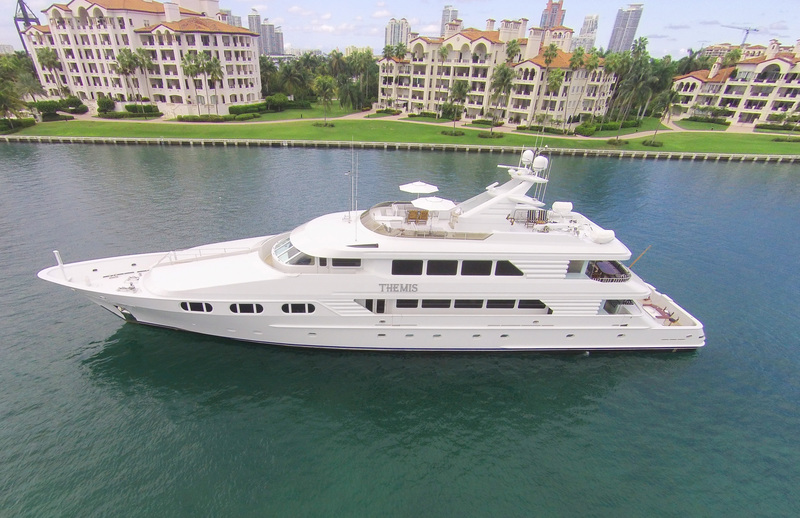 Bob Cury of RJC Yacht Sales is pleased to announce the Sale and Closing today on the 156' Trinity TDMY, THEMIS. THEMIS was built to full ABS classification and has had a multi-million dollar refit in 2015/2016. Highlights include a complete new custom interior by Scott Carpenter throughout the vessel with all new furnishings, upholstery, new carpet & new headliner, bedding, soft goods, marble showers & vanities, LED lighting, artwork, along with all new polished nickel hardware. The new contemporary interior compliments her beautiful African Pear and Sapele joinery with burle inlays throughout. All exterior decks feature new custom furnishings from Murray Brothers. Other upgrades includes new Naiad 520 'at rest' stabilizers, new electronics, KVH Sat system, new HD TV receivers, new hot tub on flybridge, new tender & waverunners. In addition, her A/C systems have been serviced and/or replaced with new compressor and air handlers. Powered by twin Caterpillar 2250HP main engines with low hours and twin Caterpillar 99KW generators, both just completing a full service along with a new bottom job, running gear plus more more! Built to full ABS and AMS classification, THEMIS represented a custom, pedigree Tri-Deck Motoryacht which offers exceptional volume and updated to today's highest yachting standards! The vessel will undergo her 20-year ABS survey certification and base out of Ft. Lauderdale, retaining the name THEMIS.